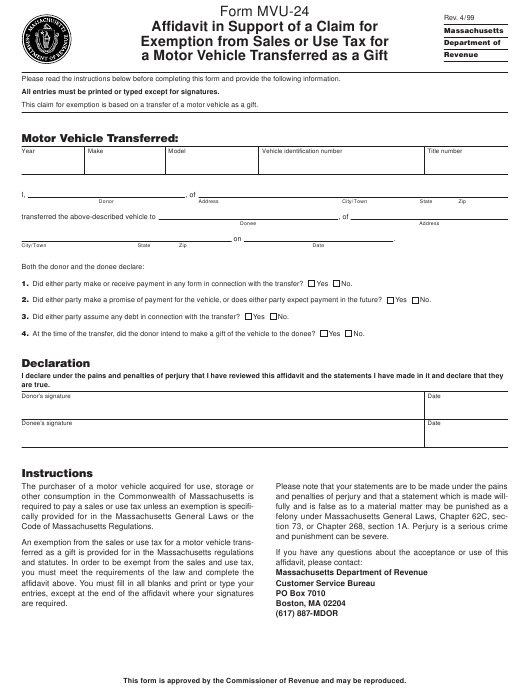 Form MVU-24 or the "Affidavit In Support Of A Claim For Exemption From Sales Or Use Tax For A Motor Vehicle Transferred As A Gift" is a form issued by the Massachusetts Department of Revenue. The form was last revised in April 1, 1999 and is available for digital filing. Download an up-to-date Form MVU-24 in PDF-format down below or look it up on the Massachusetts Department of Revenue Forms website. This claim for exemption is based on a transfer of a motor vehicle as a gift. 1. Did either party make or receive payment in any form in connection with the transfer? 2. Did either party make a promise of payment for the vehicle, or does either party expect payment in the future? 3. Did either party assume any debt in connection with the transfer? 4. At the time of the transfer, did the donor intend to make a gift of the vehicle to the donee?